The vicious horrors of Pathfinder Roleplaying Game Bestiary 4 come alive on your tabletop with this box-busting collection of more than 300 creature pawns for use with the Pathfinder Roleplaying Game or any tabletop fantasy RPG. Printed on sturdy cardstock, each pawn contains a beautiful full-colour image of a monster from the fourth volume in the Pathfinder RPG's core monster reference series. Each cardboard pawn slots into a size-appropriate plastic base, making it easy to mix with traditional metal or plastic miniatures. 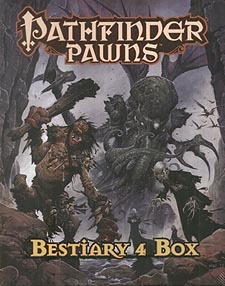 With multiple pawns for commonly encountered monsters and over 200 distinct creature images, the Bestiary 4 Box is the best way to ensure you've got the perfect foes to make your Pathfinder campaign deadlier than ever.